Nearly a decade after the US unleashed its biggest debt-issuance binge in history, doubling the US debt from $10 trillion to $20 trillion under president Obama, which was only made possible thanks to the Fed's monetization of $4 trillion in deficits (and debt issuance), the Fed is starting to get nervous about the (un)sustainability of the US debt. The Federal Reserve should continue to raise U.S. interest rates this year in response to faster economic growth fueled by recent tax cuts as well as a stronger global economy, Dallas Federal Reserve Bank President Robert Kaplan said on Wednesday. "I believe the Federal Reserve should be gradually and patiently raising the federal funds rate during 2018," Kaplan said in an essay updating his views on the economic and policy outlook. "History suggests that if the Fed waits too long to remove accommodation at this stage in the economic cycle, excesses and imbalances begin to build, and the Fed ultimately has to play catch-up." The Fed is widely expected to raise rates three times this year, starting next month. Kaplan, who does not vote on Fed policy this year but does participate in its regular rate-setting meetings, did not specify his preferred number of rate hikes for this year. But he warned Wednesday that falling behind the curve on rate hikes could make a recession more likely. Echoing the recent Goldman analysis, which warned that the recently implemented Republican spending plan could lead to an "unsustainable" debt load, Kaplan - who previously worked for Goldman - also had some cautionary words about the Trump administration's recent tax overhaul, which he said would help lift U.S. economic growth to 2.5% to 2.75% this year, pushing the U.S. unemployment rate, now at 4.1% down to 3.6% by the end of 2018, but not for long. On the all important issue of inflation, he projected it would firm this year on route to the Fed's 2-percent goal. 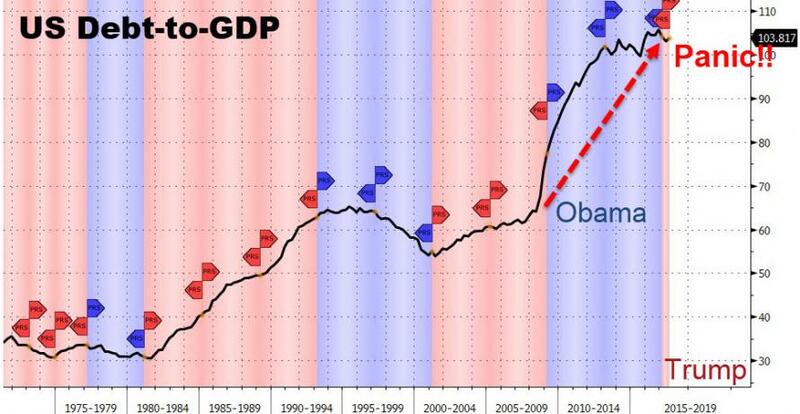 The most ironic warning, however, came when Kaplan predicted the US fiscal future beyond 2 years: he said that while the corporate tax cuts and other reforms may boost productivity and lift economic potential, most of the stimulative effects will fade in 2019 and 2020, leaving behind an economy with a higher debt burden than before. "This projected increase in government debt to GDP comes at a point in the economic cycle when it would be preferable to be moderating the rate of debt growth at the government level," Kaplan said. 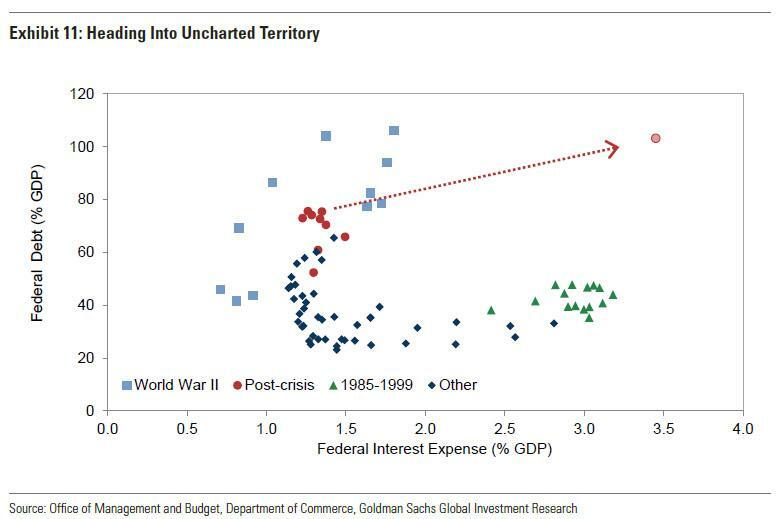 He was referring, indirectly, to the following chart from Goldman which we showed previously, and which suggests the US will become a banana republic in just a few years. A higher debt burden will make it less likely the federal government will be able to deliver fiscal stimulus to offset any future economic downturn, he said, and unwinding it could slow economic growth. "While addressing this issue involves difficult political considerations and policy choices, the U.S. may need to more actively consider policy actions that would moderate the path of projected U.S. government debt growth," he said.